Cop in the Hood: There's a hole in your boat! 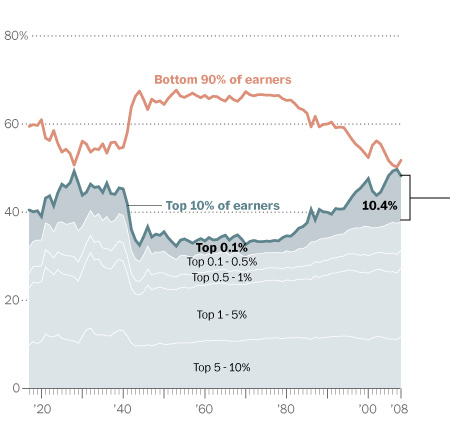 Why do you think Republicans are happy about the growth in income inequality? I'm not sure what I'm supposed to learn from this post, other than the fact you enjoy gloating. I think rich Republicans are very happy they have more money. I think poor Republicans believe the party line. What you're supposed to learn is that the rich are getting richer. You're also supposed to learn that a rising tide does not raise all boats. Maybe you already know that. But many people don't. You're also supposed to enjoy my writing. If you don't like it, please don't read it. I don't get paid for this. As to gloating... I do sometimes do so. And where's a better place for that than my blog? But I don't mean to gloat in *this* post. I'm not happy the rich get rich and poor get poor. I'm trying to maintain an outraged tone of disbelief. If that doesn't come off, I didn't write it well. The part I find most salient is the ability of the rich to advance their interests via the government. I do not begrudge a person's success, but when they use the force of the state to disadvantage their competitors they acting immorally and against the good of society. For this I'd like to see less meddling from the officials b/c they so often favor their rich friends, less subsidizing and tax breaks for companies... fewer bailouts - banks or automakers. I don't begrudge a person's success. I just want to take some of their profits to pay for a working and civil society -- the society that is the foundation upon which their success is based. And remember those companies that we bailed out because "they were too big to fail"? Well, why haven't we made them smaller? Unregulated Capitalism has never succeeded. The very idea that regulated capitalism is somehow bad is a shockingly new concept. And dangerously flawed. Of course the companies won't do this on their own. How great to be large, making billions in good years and knowing that if things go wrong, the government will cover your loses. As Yakov Smirnoff used to say (maybe he still does), "What a country!" The markets will always be, and have always been regulated. I don't think "we" needed to make them smaller - I think letting them fail would have made them a proper size. I find the ease with which you endorse "taking" other people's rightfully gained success. If a company makes it's profits without subsidy or other state advantage (I know, this isn't common for big ones) then all profit it makes is a result of making other people better off already through the voluntary exchanges of goods and services. So they have been improving society. I expect this to not resonate, but isn't it true that when you exchange (buy or sell) you improve your lot (or try to)? I expect the objection will be based on how some people don't have good alternatives. This may be true, but it doesn't mean that the exchange wasn't undertake in an attempt at self-benefit by both parties. The exchange does indeed benefit both parties. But think of a country without minimum wage laws. People will still work for whatever they can get. Even if it isn't enough to feed your family, it's better than nothing. One meal a day is better than no food. So working for sub-sustenance wages can be in your best interest. In that sense it is a "good" exchange. It's exactly why the government needs to step in and demand better labor laws and/or a government safety net funded by the profits of corporation who could, but choose not to, pay their workers more. Pretty much every company in the world could "pay their workers more" to some degree. The idea that someone who has no involvement in the company is in a better position to set the exchange, or that you and I have the right to task someone to set the rules of interaction between two other people, is problematic from moral reasons (assumption of power over others) and ignorance (we lack knowledge and direct stake in the matter). Generally we agree that the rich get too much help staying that way from the government. I just think adding power to the government and expecting it to not help the rich more is a futile pursuit.